I am just about finished reading A Mindset for Learning: Teaching the Traits of Joyful, Independent Growth by Kristine Mraz and Christine Hertz. It is a very useful and practical professional text. Mraz and Hertz discuss the habits of mind that students need to be successful, independent learners. The habits, which they refer to as stances, that they feel are important to teach are: optimism, flexibility, resilience, persistence, and empathy. In their book, they also discuss ways to help students build these habits. These ways include using storytelling, setting goals with students, teaching self-talk, and engaging students in reflection. There are so many useful ideas including ideas for lessons, anchor charts, and read alouds. I would highly recommend this professional book. Mraz and Hertz have inspired me to support my students independence by starting discussions about the habits of mind. I decided to start with persistence. In the book, persistence is defined in kid language in this way: “Having persistence means you try and try again even when it feels hard.” (Mraz & Hertz, 2015, p. 37) I thought this habit was a good starting place since reading is something that is hard for my students and having a state of mind in which they understand that persistence will benefit them is essential. Reading is a hurdle for my students in many ways and I want them to begin to think about how they can overcome their challenges through effort and hard work and the reading strategies we’ll discuss throughout the year. I used the structure recommended in the book to help students understand the concept of persistence. This structure includes four steps: studying a text, discovering a concept, naming the concept, and reflecting on the concept. I used a video and a read aloud as the texts. I showed my students a brief video clip from YouTube (I started the video after the text at the beginning). In the video, a dog repeatedly tries to get a head of lettuce off a counter and finally succeeds. 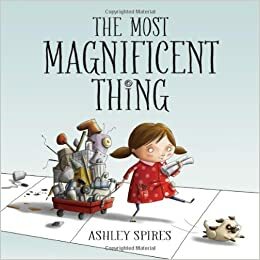 I also read The Magnificent Thing by Ashley Pires. In the book, a girl makes many attempts to create a magnificent thing. She then gets frustrated and says she quits, but her dog assistant helps her realize she should try again. In the end she does try again and is able to succeed. I involved my students in a discussion about what they noticed about the dog from the video and the girl in the book and how they were the same and different. The students discussed the fact that both the dog and the girl tried and tried again. 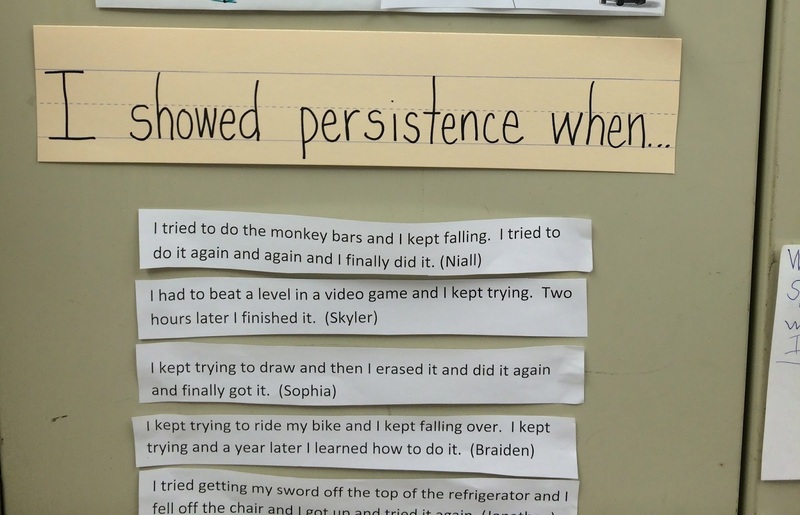 After this discussion, I introduced the students to the word “persistence.” I had the students reflect on this concept by naming ways they have showed persistence. Then I asked students to think about how this concept could be used in their reading. Students were able to relate persistence to their lives, in general, and to their reading lives. This is a habit of mind that we will need to revisit but this lesson started students thinking about the importance of persistence. 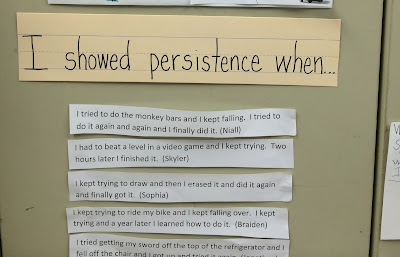 The anchor chart provides kid language to help students understand the meaning of persistence. Students had many ideas about how they've shown persistence in their lives. 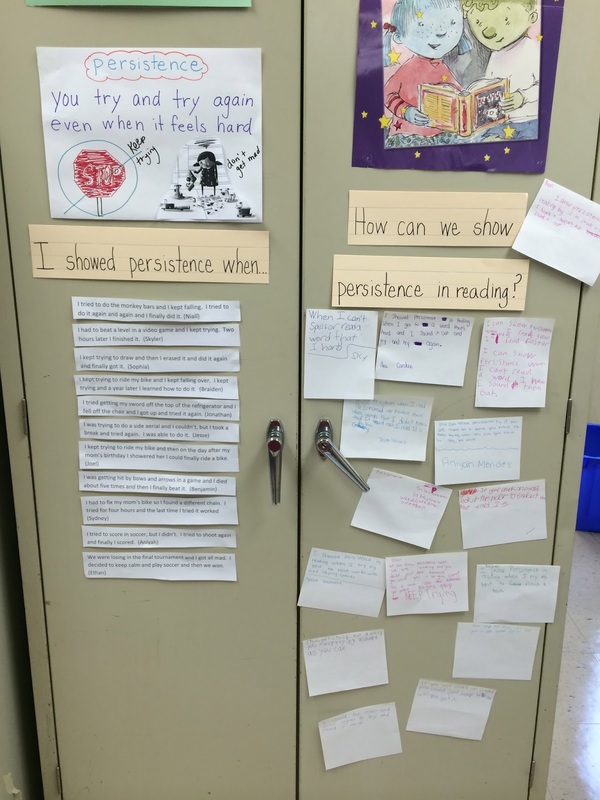 A fifth grader wrote about what it means to show persistence in reading. A second grader wrote about how she can show persistence in reading. Mraz, K., & Hertz, C. (2015). A mindset for learning: Teaching the traits of joyful, independent growth. Portsmouth, NH: Heinemann.